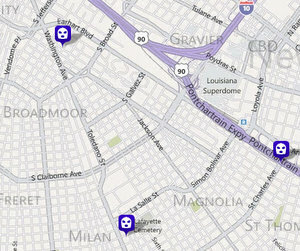 A Dominos Pizza driver making a delivery just off Louisiana Avenue was confronted by a group of masked and gunwielding robbers, a Hoffman Triangle resident was robbed in front of his house by another set of gunmen and a van driver on St. Charles Avenue had his windows smashed with a hammer by another would-be robber in separate this week incidents all under investigation by NOPD Sixth District detectives, authorities said. A Dominos Pizza delivery driver was delivering a pizza and chicken wings to a residence in the 2100 block of Franklin Court. The driver parked his vehicle and exited with the food at which time he was approached by an unknown black male. This subject told the delivery driver “Give me that” while raising his shirt to reveal a handgun in his waistband. The driver threw the pizza and chicken wings at the subject to avoid being robbed. At this moment, another subject whose face was covered approached with a gun, followed by three other subjects who were masked and unarmed. The victim ran on foot to a nearby intersection and called police. The victim stated he was outside his residence leaning on his car when three unknown black males approached him. One subject stood in front of him producing a gun, one stood behind him with a gun, and one was unarmed. The unarmed subject went into the victims pocket and removed his cell phone and cash. The subjects then fled the area on foot. Perp #1: black male, dark complexion, approximately 18 years old, 6’00”, thin build, medium mustache, wearing a black hooded sweatshirt, black jeans, and white shoes. Perp #2: Black male, dark skin complexion, wearing a nylon jacket with zipper, black jeans, and white shoes. Perp #3: Black male, dark skin complexion, wearing a red hat with a white design and black jacket. The victim, who works for a transportation company, dropped his passengers off in front of the Quality Inn Hotel at 1319 St Charles. He collected his fare and was returning to the drivers seat of his van when a unknown black male approached him and stated “Sir, I need that money you just got.” The victim told the unknown subject “Get out of here” and shut the door to his van and attempted to drive off. The subject produced a hammer and began hitting the passenger side window causing it to shatter. The subject then hit another window causing it to break as well. The victim drove off, at which time the perpetrator began to follow the victim in a red two door Infiniti coup (tinted windows, no license plate) The perpetrator pulled alongside the victim and taunted him at the intersection of Calliope/St Charles, then fled the area. The perpetrator of this robbery is described as a black male, approximately 27-30 years of age, 6’0” tall, thin build, flat top hair style, wearing a blue shirt, and grey running pants. If you have any information regarding the above cases, please contact the Sixth District Investigative Unit at 504-658-6060 or Crimestoppers at 504-822-1111.
these thieves have no shame, trying to rob people who are WORKING for their money. its a d@mn shame! we need more uptown police patrolling the area.